I've got a project to share today, but it's not exactly a pattern. It's an idea for a pattern. I shot pictures as I went along, thinking that I was going to write it up, but now that it's complete, I'm a little iffy on it. So I thought, instead, I'd show you a little about my design process. I saw a cute idea on Pinterest for a pillow that wrapped around a car seat belt, for kids on long car trips. I thought, "Cute idea! I should make one of those for Mims." Alas, the link was for a company that was selling the actual finished pillows. They were a little pricey for a whim, so I then thought, "Still, it's a cute idea. I can figure out how to make one for Mims." 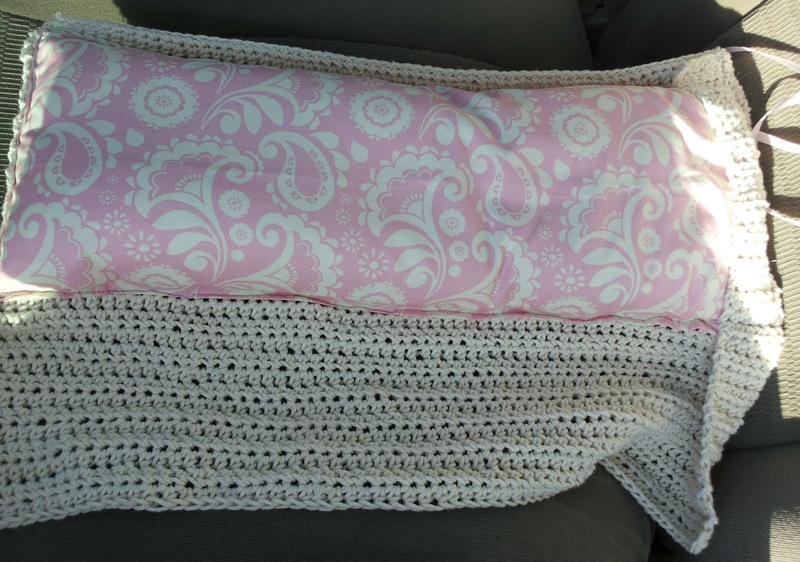 Meanwhile, I had just made an Ikea run and had brought home several "naked" pillow forms to crochet covers for. My favorite were the ninety-nine cent stomach-sleeper pillows. I had made some throw pillows last year out of them, so I knew I could sew and cut them to whatever size I wanted. Besides, if I screwed it up, I was only out a buck! I thought I wanted my car pillow to be made up of two 4" pillow sides, so I measured out 8" columns which I sharpied onto my pillow. I sewed along the marker lines, and then cut my pillows apart. 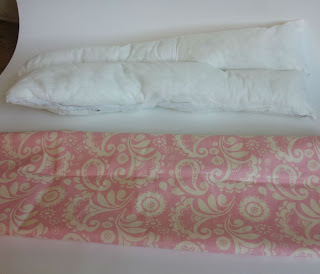 I was able to get three 8"x19" pillows out of one stomach-sleeper pillow. Score! 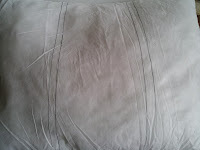 Then I sewed a seam down the center of the pillow, to crease it so that it would fold around the seat belt. 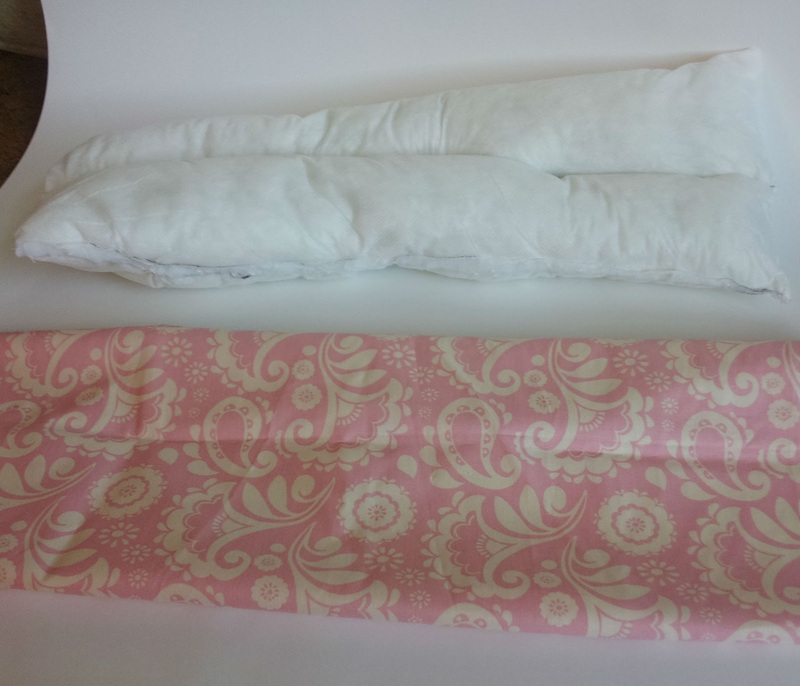 Then I used a piece of scrap fabric (9"x40") to make a pillowcase for my new pillow. I sewed the fabric, right sides together, along both of the long cut ends. Then I turned it right side out and poked the corner out so that they were sharp. I would have ironed the pillowcase, but I knew that it was going to be encased in crochet, and the day was too hot to bother. Besides, I was making it for Mims, not a private client. So I slid my pillow into the case, tucked the open end inside around the pillow and sewed the case closed. Next I got to crochet my cover. It took an entire skein of Lion Brand Cotton 100% Cotton worsted weight yarn. I used a size G hook. I made my piece 70 stitches long, and just went back and forth using hdc stitches until the skein was gone. I was left with about 18" of yarn for a tail. I sewed my covered custom-sized pillow onto my crocheted piece, leaving about an inch of crochet as an edge I could use later for installing the pillow into my car. I wasn't sure at that point how I was going to do it, and I wanted plenty of room in case I decided velcro was the best way to go. 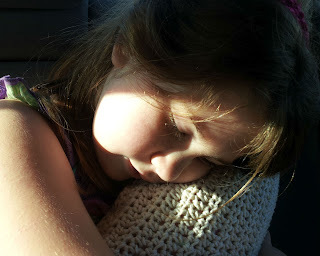 I also discovered at that point that 70 stitches was about 5 stitches too long for my pillow form. So I folded the bottom edge over the pillow and stitched it down. 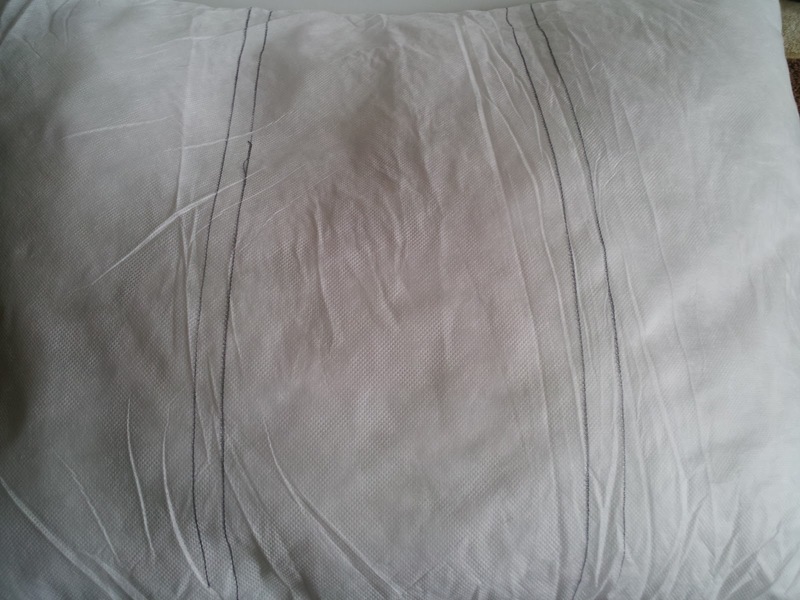 I then stitched the pillow down on the other side, catching the folded edge in that seam too. 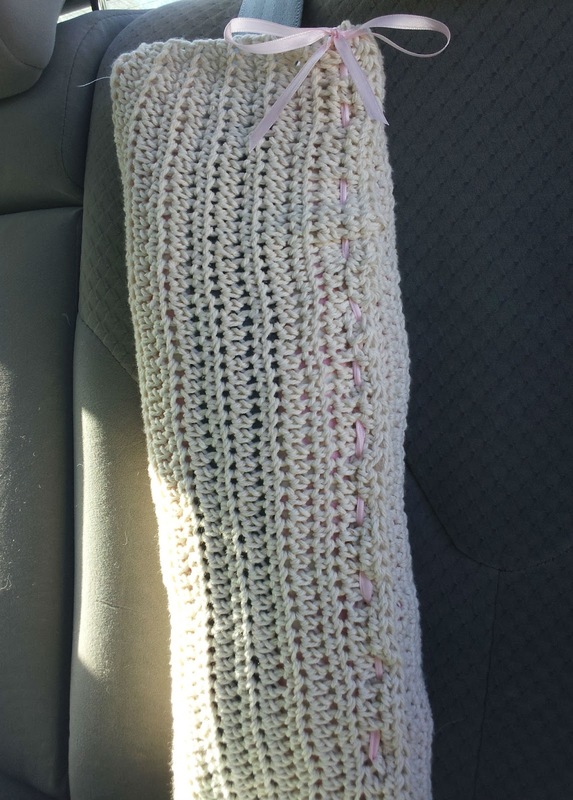 That left me with a poufy pillow part and a long flat blanket-y piece to wrap around the seat belt. Mims likes her new cover a lot. She has always hated seat belts, ever since the one horrible incident where I pulled her belt out too quickly and she got a rope burn from it. Would that be a belt burn? Anyway, I still feel awful about it, and this in no way makes up for my accident, but it does make it so that she will allow the belt to be next to her neck, which is much safer than her holding it away from her body. The pillow didn't fold around the belt like I had hoped. I would make it even narrower next time, I think. Maybe 6". And I would save myself the crochet and only use 65 stitches for the length of the cover. I love the ribbon closure. Do you have an opinion? Should I have waited until this idea was perfected before I shared it? Or does this spark your own ideas on how to improve upon my design? I would love to hear what you think. Hi Syl! Merry Christmas to you too!! 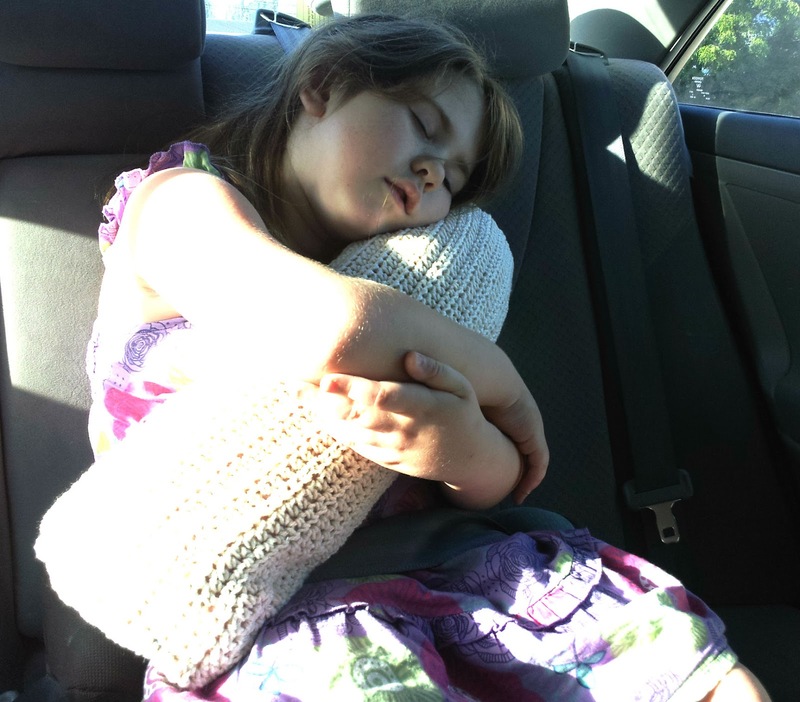 Ooh, a snuggle dolly would be awesome, instead of a hard, scratchy-edged seatbelt. Hmm. I'm going to have to think about how to do that! Great idea!!! What kind of pillows are good for me and my husband. We bought a pillow top 1 years ago that we can’t flip every few months and now have a dip in the middle of the pillow because we sleep hugging most of the night. The nights we don’t hug our neck hurt because of the dip pulling us to the middle. So I find guide on how to choose the best pillow to get a beauty sleep. Fantastic, I'm enjoyed read this post, Every time search this type of post. Really I enjoyed. This article is really very interesting and effective. I think its must be helpful for us. Thanks for sharing your informative.